Holds ten pairs of dumbbells. Heavy duty 11-guage steel construction. 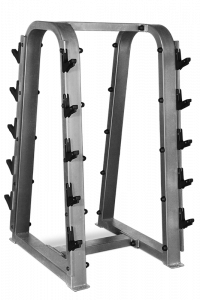 Holds ten fixed curl bars or barbells. 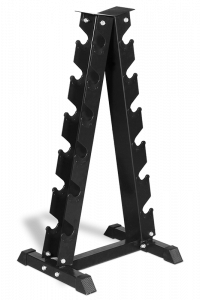 Heavy duty 11 gauge steel construction. 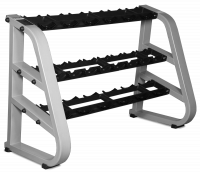 Urethane protective saddles. 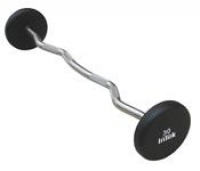 Intek's top-of-the- line, state-of-the-art Dumbbell, is a solid steel product that is Urethane encased. Intek uses and interference fit, double welded, stainless steel handle in a 31mm thickness. 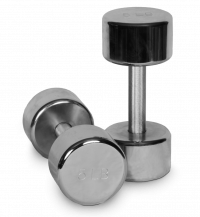 The handle is even upgraded once more at 80 pounds for additional durability. Intek is currently the only company laying claim to "ZERO" failures in the field with the current top end product.